Sometimes trying to decide exactly what records to feature in this space can make for time consuming decisions. What can I say, I’m a Libra. For the past couple of Pelangas I’ve played the title track from this wonderful Nimon Toki Lala record and each time someone has come to the DJ booth to ask “Who is this? !” So I figure that’s a good clue that I need to be posting it here—not to mention she’s one of great vocalists from Togo, a country we’ve yet to highlight. What I love most about this Nimon Toki Lala record after her voice are the different styles she features. Unfortunately there’s no mention of date, but my guess is late 1980s. 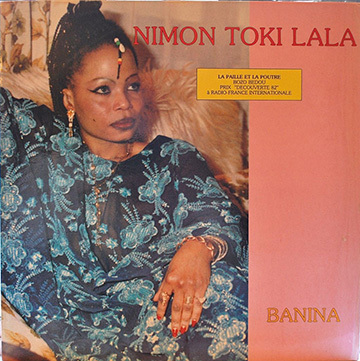 The album opens up with this feel-good soukous, Banina. Later we get this amazing song, La Paille Et La Poutre, with Nimon’s soaring voice over a style of rumba I’ve never heard before. And you gotta love the pasted in applause. I’m not sure if this rhythm is typical Togolese or not, but I’m in love with it! Then to switch things up a bit more here we have a guest singer alongside Nimon doing an excellent makossa called Vafa Djinam. Again no mention on the record sleeve of who this male singer is or who the musicians are. If anyone has an idea of who else was on this recording I’d love to know. This entry was posted in PELANGA RECORDS! and tagged Makossa, Nimon Toki Lala, Rumba, Soukous, Togo by Jacobo (DJ Pozole). Bookmark the permalink. It’s saying plug ins are missing so I don’t think they’re able to play on page. I looked her up anyway and the first one you mentioned was pretty decent :).